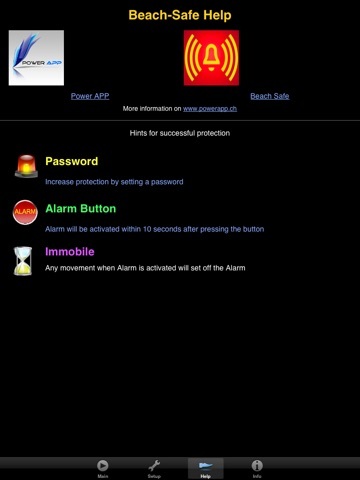 Beach Safe sets off a loud alarm if the device is moved without permission. Everybody near will notice if somebody without permission moves away your iPhone, iPod touch or iPad. To move the device a Passcode Lock is needed. If a wrong code is entered it will set off a loud alarm, if no code is entered it will set off a loud alarm tone as well. 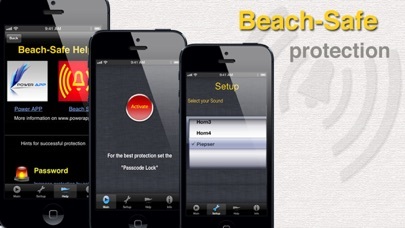 Beach Safe doesn't protect you from thieves, but it makes sure everybody nearby will notice the person taking or moving your device without your permission. If your device is moved despite lacking authorization, it will send GPS coordinates to a preconfigured e-mail adress, making it simple to track your device. Listed as cool app on Telefon.de! Beach Safe helps to make thieves life harder!